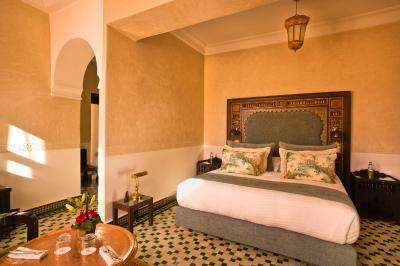 Lock in a great price for Riad Fes - Relais & Châteaux – rated 8.9 by recent guests! 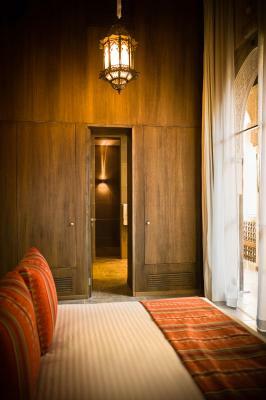 Gorgeous renovation of Riads in the old style. Amazing view from roof bar. Comfortable beds and pillow!!! Warm and helpful staff. Riad was beautiful and location was near the Medina. The hotel facilities and common areas were beautiful and the many staff made you feel very secure in the hotel. A tour was easily arranged and hotel had every amenity listed. The cookies in the room were delicious! I loved the fact you are given a warm welcome (customary Riad tradition, your party is given mint tea and delicious dates) yet it felt like a luxurious hotel at the same time. There were two bars, a restaurant and a beautiful pool (I only stayed one night and didn’t use these accommodations so can’t give a review) Even though I paid for a standard room I got bumped up to a suite, free of charge (not sure why-I just accepted and went with it). Well, the suite was obviously amazing!!. It had marble floors, French doors opening to a beautiful and private terrace. The spa bathroom was huge with double sinks, and a separate shower and spa tub!! Although I can’t review the standard rooms, based on my experience, they must be, at the least, comfortable and stylish! One of the other main attraction is the close proximity (really just inside) to the old Medina, where thee real charm of Fes lies!! Gorgeous and extraordinary rooms and public spaces. We had a somewhat unique experience in that we stayed in 3 rooms across our 2 nights and each room was very different and luxurious. The rooftop terrace views are amazing. Breakfast was a real highlight. Staff in the restaurant were very friendly, especially to our child. Bath products (including local soap and clay) were a lovely touch. Based on my prior travel in Morocco, I was not expecting to be impressed but I was very pleased. 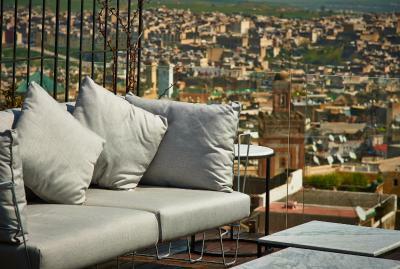 The staff, the hotel, the room and the rooftop view exceeded my expectations and I was more than impressed. I will recommend this location to all friends traveling to Fes. the place is really amazing. This hotel is like an art piece. Each corner has the wonderful detail. I like everything in this hotel. It is really very good experience. Staying at Riad Fes was an exceptional and authentic Moroccan experience ! The welcome, ambiance, the decor, staff and their service, food served in the restaurants including breakfast were of an outstanding quality. The pool was refreshing on an extremely warm day and we enjoyed cocktails and other drinks poolside. The staff organised transfers to and from the Riad and also a guide for the Medina tour. 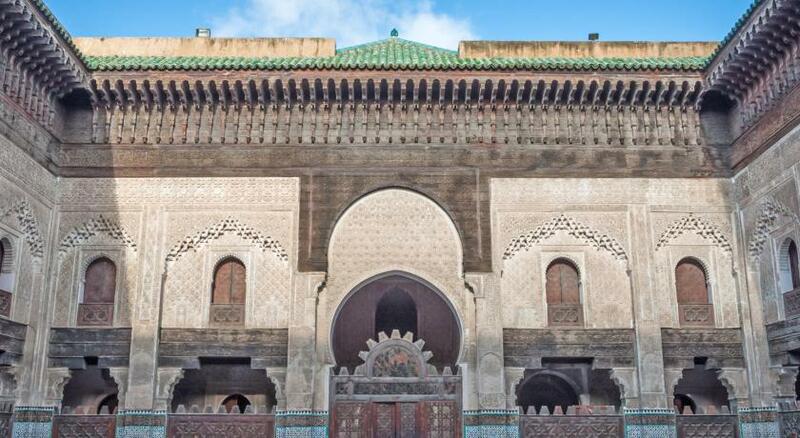 Our luggage was couriered from the Medina gate to the Riad on arrival and departure. Our stay at Riad Fes was certainly a highlight of our Moroccan experience. 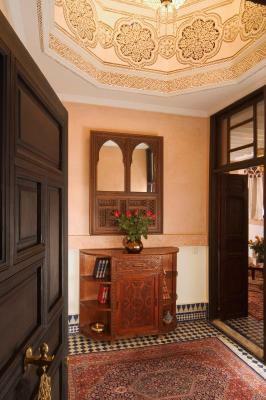 In the heart of Fes medina (historic quarter), this Riad is a a 25 minute drive from Fes International Airport. It offers air-conditioned rooms and suites with oriental furnishings and a panoramic pool-side terrace with views of the Atlas Mountains. The Fes Riad’s restaurant serves authentic Moroccan cuisine. Meals can be served in the hotel’s dining room or on the roof-top terrace. Guests can relax in the outdoor swimming pool or hammam. 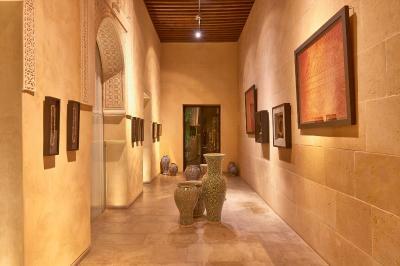 The Riad also provides a 24-hour front desk with currency exchange service and a tour desk. 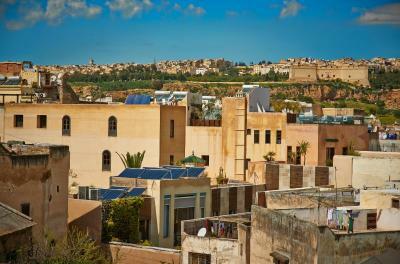 Fes El Bali is a great choice for travelers interested in street markets, shopping and markets. When would you like to stay at Riad Fes - Relais & Châteaux? This room has a private bathroom and is decorated in warm colors. Decorated in warm tones, these rooms feature marble or tadelakt bathrooms. They offer views of the plunge pool and the patio. This room can accommodate and extra bed. These suites feature unique decor with carved, wooden furniture and hand-embroidered textiles. They have views of the Riad's patio and plunge pool. This suite can accommodate and extra bed. 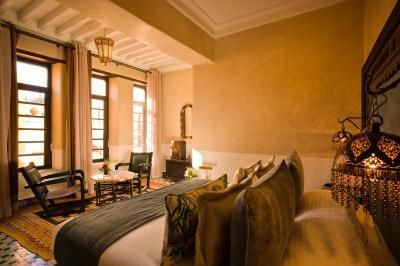 Decorated in traditional, Moroccan style, this suite features a living room and a spacious, tadelakt bathroom. It offers views of the Riad's garden, pool and fountain. This suite overlooks the Andalous Pavilion and garden, and features a terrace and a marble bathroom. Area Info – This neighborhood is a great choice for travelers interested in street markets, shopping and markets – Check location Excellent location – show map Guests loved walking around the neighborhood! House Rules Riad Fes - Relais & Châteaux takes special requests – add in the next step! All children under 12 years are charged EUR 50 per person per night for extra beds. Riad Fes - Relais &amp; Châteaux accepts these cards and reserves the right to temporarily hold an amount prior to arrival. Riad Fes - Relais & Châteaux accepts these cards and reserves the right to temporarily hold an amount prior to arrival. A mandatory Gala Dinner is included in the room rate for stays on December 24th and December 31st. The rates of the Gala Dinner are based on room type and occupancy (guests sleeping in extra beds will be charged separately). The staff was incredibly nice! The young people who attend the bar and the restaurant were amazing, always with a big smile, extra courteous and making you feel that most important person in the place! Super room, super staff, and super location. Staff and service was not the best. The bathroom was run down which did not make me feel comfortable about the cleanliness of the room. Mold and yellowed grout in the shower, a clogged sink, and opened toiletries was an unpleasant surprise. The towels smelled like frying oil, perhaps it was just the brand they use for washing but I prefer clean fresh smelling towels/robe. The decor was beautiful and the service excellent. Although the inside of the restaurant wasn't very impressive, sitting by the pool was lovely and definitely recommended! Like many converted homes, the rooms are a bit awkward, e.g. outlets And the Wi-Fi was weak or absent in some areas.